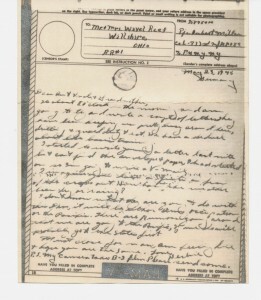 V-mail from Herbert Miller, Germany, 1945. 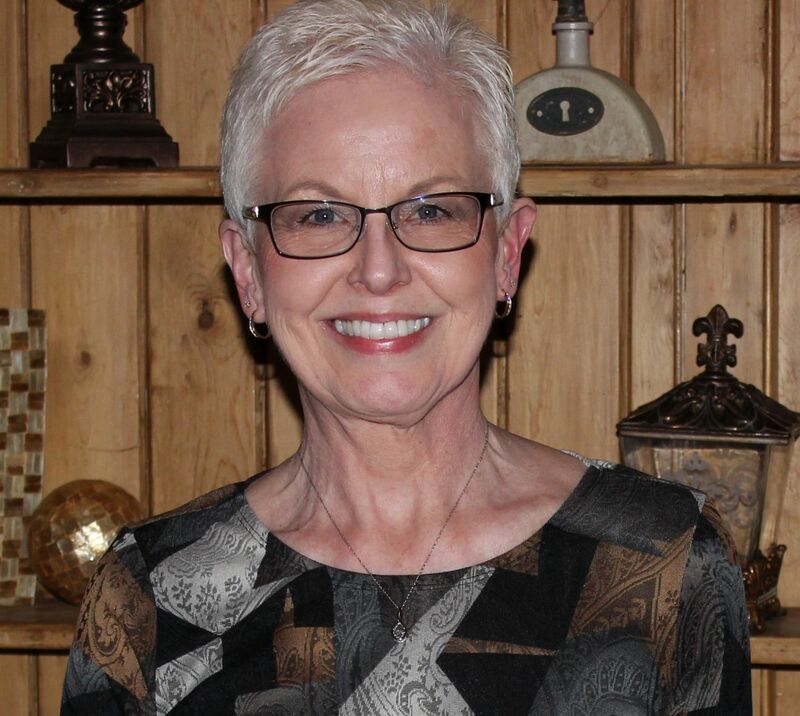 I am a Charter Member and supporter of the National World War II Museum in New Orleans. They recently sent me information about one of their programs, Operation Footlocker. Operation Footlocker gives school children across the country the opportunity to see and touch real World War II artifacts, while adding to their WWII education. Each footlocker sent to a school includes items such as V-mail letters, ration books, dog tags, sand from the beaches of Normandy and Iwo Jima, wartime magazines, a cloth map, a US Army Foreign Language Manual, a Savings Bond Stamp Book, a gas mask, Philippine Occupation Currency, an American tank periscope, a 1943 steel penny, to name a few. A footlocker can be kept at a school for one week and costs $50 for the 2011-2012 school year. The cost is normally $100 but is less right now because of a grant. Specific details about the program are on National World War II Museum’s website. It’s about 8 o’clock in the morning and I am going to try and write a couple of letters. They have been keeping us pretty busy around here, drilling & guard duty & etc. We have a schedule about like basic training. I started to write you a letter last nite & can’t find the envelope & paper I had started on so I’m going to write a V-mail. I imagine you have a quite a few of the crops out. How has the weather been, dry or rainy? I don’t know what they are going to do with this Div., it will be either Army occupation or the Pacific. These are Rumors going around that we are going to the Pacific, ? we do will probably go to the states first. Must close for now, am feeling fine & hope you are the same. PS My camera takes B-2 film. Please send some. What exactly was V-mail? 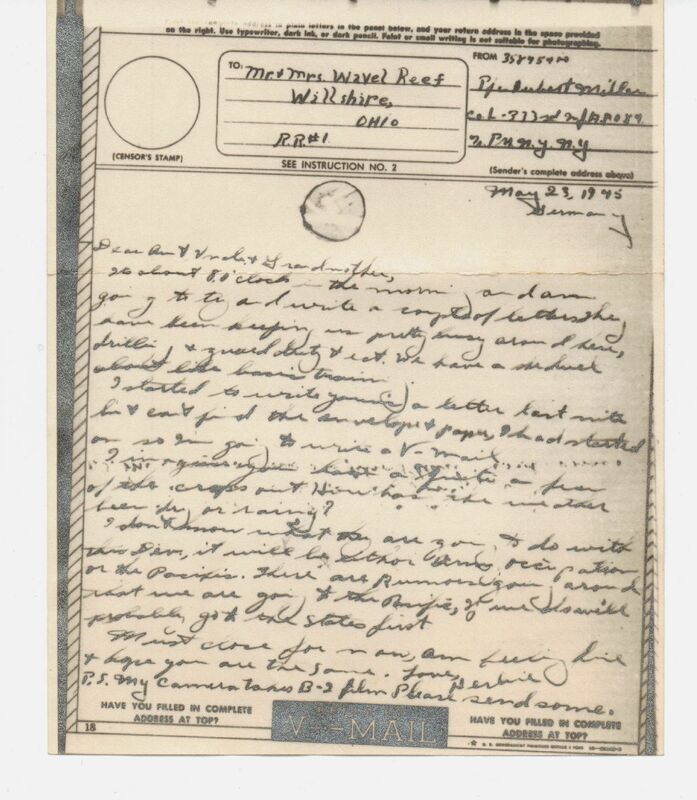 V-mail, short for Victory Mail, was a mail process used to correspond with soldiers stationed abroad during WWII. The process was created in 1942 to reduce the space and weight required to ship soldiers’ letters home. The process was based on the British Airgraph process. It worked like this: The V-mail letter sheets were a combination letter/envelope and they formed an envelope when folded. 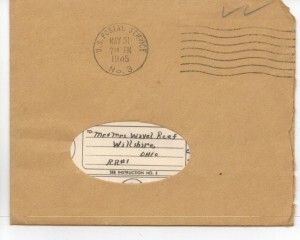 Soldiers wrote their letters in a limited space and added the name and address of the recipient on the special stationery. V-mail stationery was about 7 X 9 inches and no postage was necessary. The letters were first read by military censors. After that they were copied to microfilm by the US Army Signal Corps. Each letter was reduced to about thumb-nail size on the film. The rolls of microfilm were flown to the US and developed at a receiving station near the addressee. The letters were enlarged and printed on paper at about 60% of their original size, or about 4 1/4 x 5 1/4 inches. The V-mail letter was then delivered to the addressee. The first Army operated V-mail station overseas was opened on 15 April 1943 at Casablanca, North Africa. 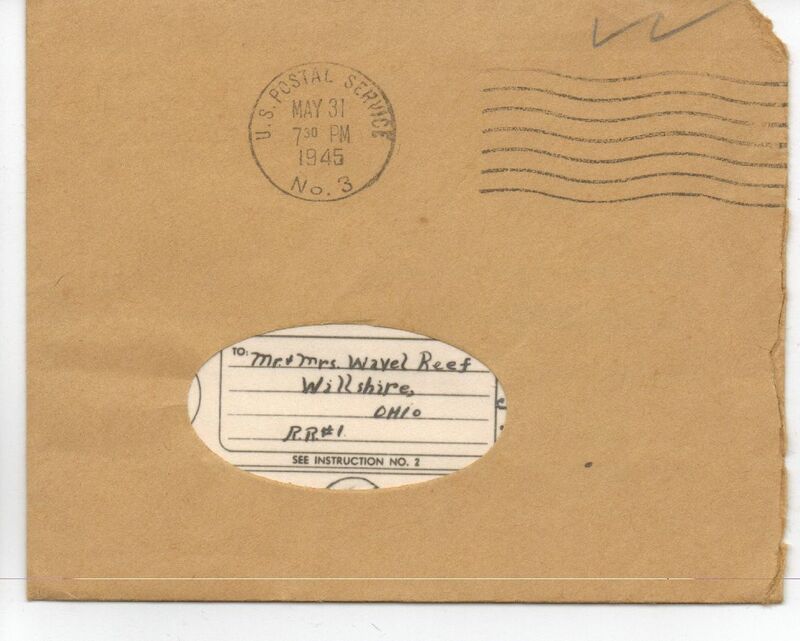 Between June 15, 1942 and April 1, 1945, over 510 million pieces of V-mail were received from military personnel abroad and over 556,513,795 pieces were sent from the U.S. to military post offices. There were a few other advantages of V-mail. It deterred espionage communications by foiling the use of invisible ink, microdots, and micro printing. None of those techniques could be reproduced in a photocopy. The process also allowed more letters to reach military personnel faster around the globe. Evidently Johnny & Clara sent my dad the camera film he asked for. 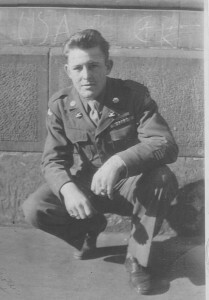 This is one of my favorite photos of my dad during WWII. He developed this photo himself while he was in Germany. By the way, my dad is listed in the National World War II Museum’s Honor Roll of Charter Members on-line. Thats my big brother. Looked pretty good with hair. Truman and the Atomic Bomb probably saved him from invading Japan. I think Truman saved a lot of lives on both sides by avoiding an invasion. We will never forget the Battle for Freedom for which so many young American people fougth, soldier, sailers and airmen. It was also the industrial power that saved us in Europe from evil. So many have been forgotten because their graves or twisted bodies were never found. Time goes like memories by. But we have a duty towards ourselves and others to not forget the sacrifices. Well said. Thank you! My dad fought in Holland during WWII.